Over the past year, highlighting has taken over the beauty and makeup world, and there's no surprise really I mean, it's bloody fantastic! I know that for me, its one thing having a dreamy highlighter, but I also think its vital to have a great tool for applying said highlight. So, seeing as I've tried about 270842 different brushes, I thought I'd narrow it down and present to you the only 3 highlight brushes you will ever need in your collection. Crown Brush C330 Blending Crease Brush | £5 | This is actually the first brush I used when I started highlighting, marketed as a detailed crease brush for eyeshadow, it's also amazing for getting that highlight-on-fleek look. The actual hairs on the brush are pretty long and tapered, making this the perfect brush for a precise highlight along the cheekbones, brow bone, or wherever you fancy! Sigma F35 Tapered Highlight Brush | £15 | This is probably my favourite of the three brushes and the one I use the most often. It's basically an enlarged version of the previous brush, but what's so beautiful about this is that the bristles are ridiculously soft. It picks up a generous amount of highlight yet applies the product so it looks flawless and diffused, not like you have a huge glowing stripe on your cheek! Plus, it comes in rose gold too. Anastasia Beverly Hills Pro Face Detail Brush | £25 | Anyone who follows my instagram knows that I would probably die for ABH products, I'm just never ever disappointed. The A23 brush has a flattened, fanned out shape and is perfect at applying the perfect seamless, soft focused glow to the face. 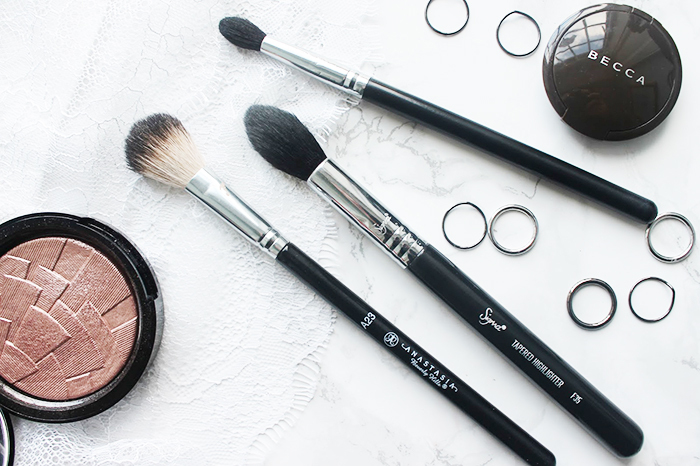 It's a little steeper on the bank account at £25, but to me it's worth it for the quality you get with this brush - and it's multipurpose for other powder products too, so you can't go wrong. Do you have a favourite brush for Highlight? *This post contains a sample sent to me for review. For more information, see my disclaimer.